Laura Millard launched her photographic investigation of snow and ice as a way of informing her painting, but the beauty and complexity of the images held her attention. Natural formations, such as frozen currents and air bubbles, as well as the sharp, arbitrary lines made by skaters leave their traces on her photographic images. 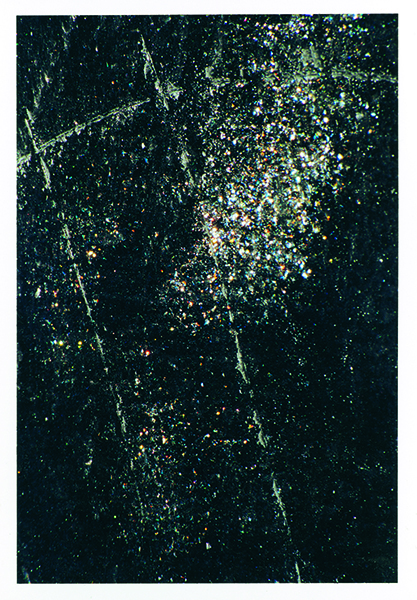 Millard reworks these photographic surfaces with oil paint, enriching them with colour and texture. Laura Millard’s current work combines large-format colour photography and paint to record the complex patterns of air bubbles and current found in frozen lake ice. Millard is interested in painterly and photographic responses to intricate phenomenon in the natural world, overlaying gestural traces indexed in the photograph and the painted mark. She is an associate professor and chair of the Drawing and Painting Department at the Ontario College of Art and Design in Toronto, and her work has been exhibited in artist-run, commercial, and public galleries. She is represented by the Michael Gibson Gallery in London, Ontario, and the Jeffrey Coploff Gallery in New York. Laura Millard, Rupture (2005). Courtesy of the artist and Michael Gibson Gallery.